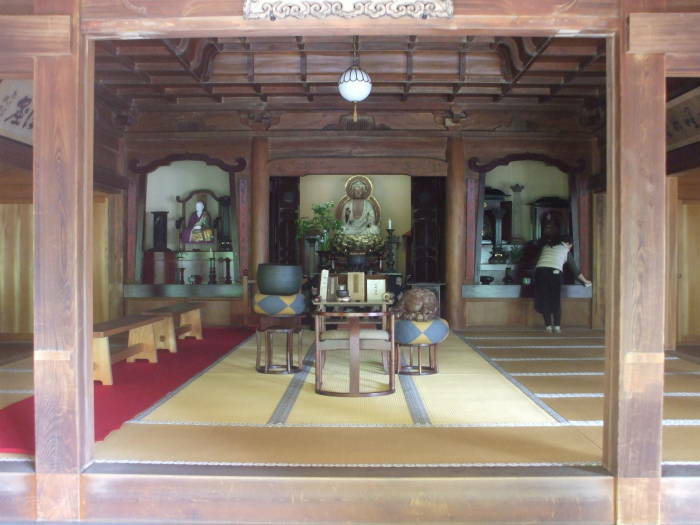 The nunnery of Tōkei-ji was established in 1285 by the widow of a powerful leader. Men were not allowed to enter for over 600 years. I will take the local train to the next station north of Kamakura and start the day's sightseeing. 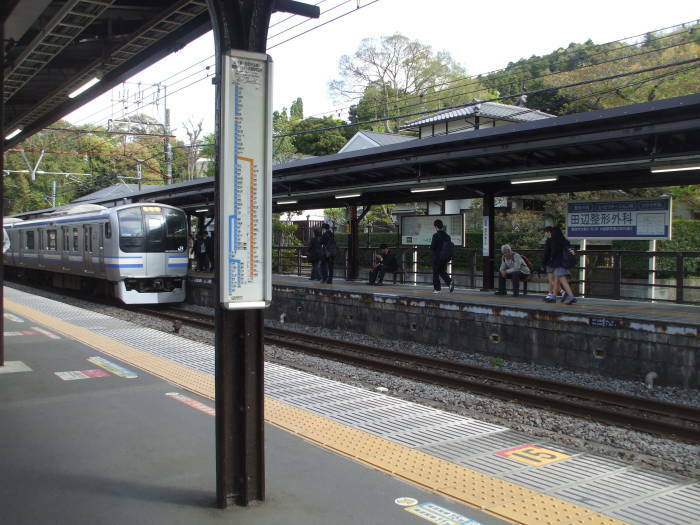 The town of Yamanouchi is now commonly known as Kita-Kamakura, as that's the name of the train station. 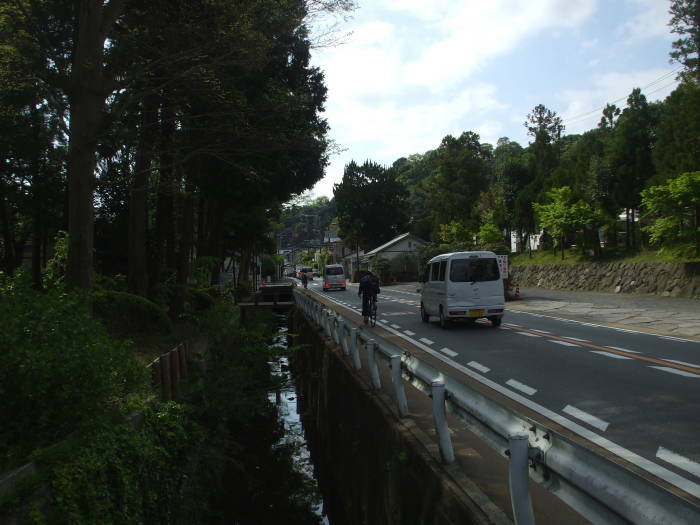 It was the northern border of Kamakura during the Shōgunate. 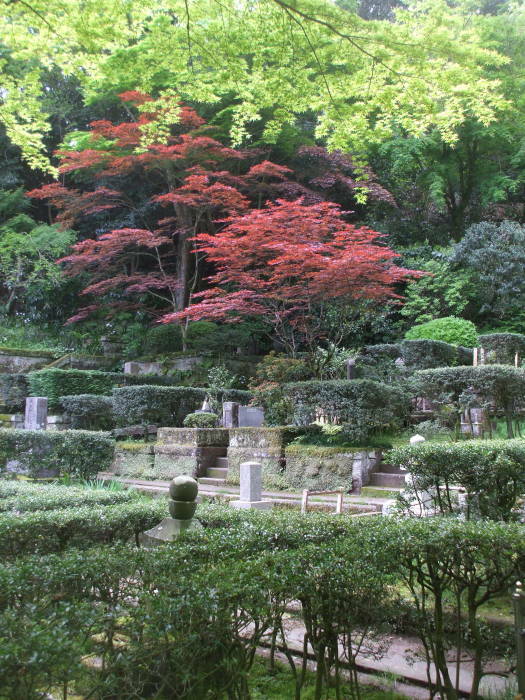 Three of the Kamakura Gozan, the five high-ranking Zen Buddhist temples, are in Yamanouchi. I walked from where I was staying at the Kamakura Central Guest House to the Kamakura station and picked up breakfast. O-nigiri and green tea. Then I added some credit to my Pasmo card. There are both Pasmo and Suica rail cards, they're fully interchangable. I had a Pasmo card because that's what they sold at Tōkyō-Haneda airport where I arrived. The automatic train ticket machines are a little intimidating at first, but they're not too hard to figure out. There is usually a map with all the station names in both kanji and romanji, meaning that your destination will be spelled out in the Roman alphabet. And, there will be an "English" button on the machine interface. 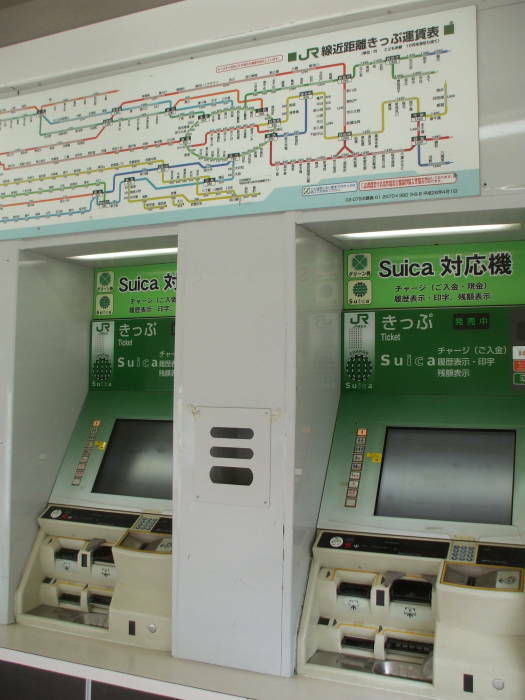 You don't really need to check your Pasmo or Suica card balance in advance. You can simply swipe your way into the station, ride to your destination, and try to exit at the other end. You can use a machine there if you need to add credit. Now I was ready to ride just one stop north to Kita-Kamakura. 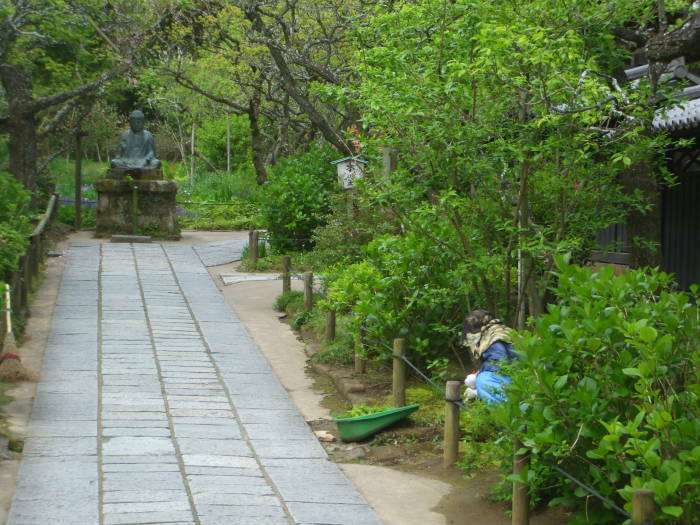 There are very few places to sit down or dispose of trash in Japan. I quickly learned to take advantage of any opportunity to do either. 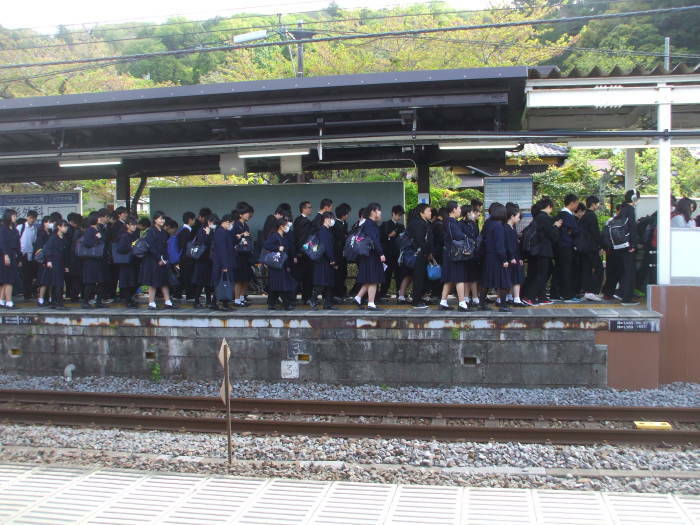 The train platform provides both, along with constant activity to watch! This line carries a train each direction every five to ten minutes. I'll eat my o-nigiri and drink my tea and watch people go to school and work. There's a trash receptacle for the plastic wrapper of the o-nigiri, and recycling bins by the drink vending machines for the green tea bottle. Trash receptacles are very uncommon but there is almost no litter. You are not supposed to litter, so no one does. People carry trash all day long if necessary. To get to Tōkei-ji I'll exit the station on the side toward the highway, passing a small park, then turn left and continue along the road for about 300 meters. The "Five Mountains and Ten Monasteries System" was a network of state-sponsored Zen Buddhist temples. The system was established in China during the southern Song dynasty of 1127-1279. The same system was adopted in Japan during the Kamakura Shōgunate. 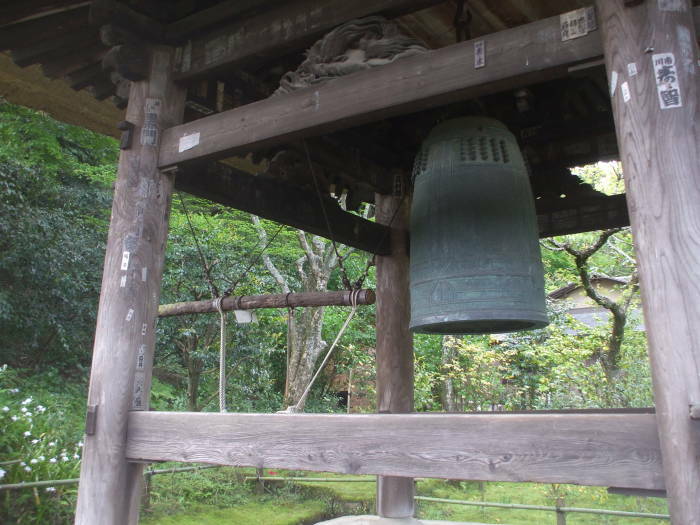 Ten "Five Mountain" temples were established in Japan, five in Kyōto and five in Kamakura. There were ten smaller temples directly under those, and many more smaller temples further down. The system functioned as a governmental bureaucracy in both countries, allowing the ruling class to stabilize and control the nation through the temple network. 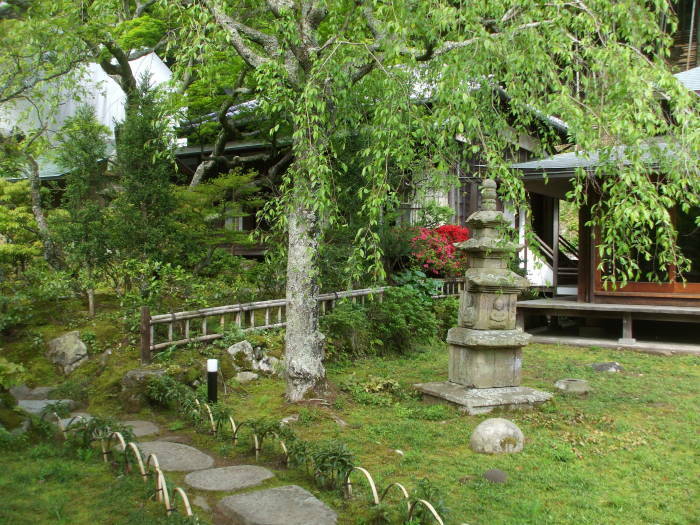 The Rinzai school of Zen Buddhism in the Five Mountains system created much of what we think of as core Japanese cultural arts — calligraphy, painting, the tea ceremony, architecture and garden design, martial arts, and more. 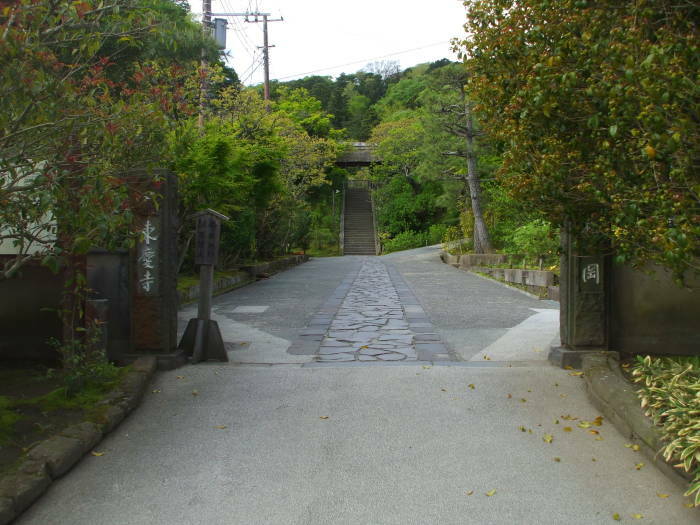 Kamakura had a parallel "Five Mountains System" set of nunneries, the Amagozan. Tōkei-ji is the only one that remains today. I'm ready to head down the road to Tōkei-ji. It will be off the right side of the road about 300 meters down. There was a sign along the road in both Japanese and English. So how did the nunnery come to exist? It was connected to Mongol invasions by Kublai Khan, and the Kamikaze or "Divine Wind". The Hōjō clan were officially just the shikken or regents of the Kamakura Shōgunate, but they held the real power. They had first intermarried with and then taken control from the Shōgunate. They no longer consulted the Shōgunate council or the Imperial Court in Kyōto. They made their decisions at private meetings in the clan homes. The Hōjō ran the country. Hōjō Tokimune was shikken from 1268 through 1284. 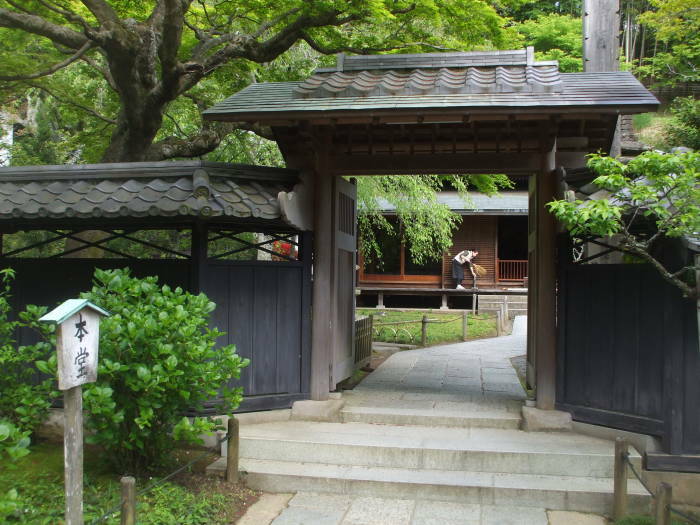 His support of the Five Mountains system firmly established Zen Buddhism in Kamakura, from which it spread to Kyōto, and later spread throughout Japan. Kublai Khan of the Mongol Empire sent emissaries carrying a threatening letter to Japan in 1266. It had flowery wording, but it essentially demanded that Japan become a vassal state and pay tribute, as the Korean kingdom of Goryeo had. Tokimune sent the emissaries back with no answer. Kublai sent a second set of emissaries in 1268, and Tokimune also sent them back with no response. The Mongols sent more emissaries with threats: March 1269, September 1269, September 1271, and May 1272. The Emperor suggested compromise, but that was just the Emperor talking. Tokimune had the Mongol emissaries driven off without permission to even land in Kyūshū. A Mongol invasion fleet landed in Kyūshū in November 1274. It had an estimated 15,000 Mongol and Chinese soldiers and 1,600 to 8,000 Korean soldiers, carried in 300 large vessels and 400 to 500 smaller craft sailed by several thousand sailors. Tokimune had mobilized all of northern Kyūshū. The landing beach in Hakata Bay was defended by a force of 3,000 to 6,000, led by samurai. There had not been a major combat event in Japan for about 50 years, so no Japanese leader had experience moving large forces. Warfare in feudal Japan was usually single combat, not armies against invasion fleets. Meanwhile the Mongols had a larger force, they were experienced in large operations, and they had superior weapons: long-range composite bows, bow-fired arrows with small rocket engines and exploding warheads, and ceramic-shelled grenades thrown by slings. Conditions appeared to favor the Mongol invasion. A typhoon approached late in the day. The Mongol ship captains called for the the landing force to reembark to avoid being left on the Japanese beach. The fleet would ride out the storm at sea. By the next morning, most of the ships had gone back out to sea, and most of those had been destroyed by the storm. Small Japanese boats were more maneuverable, and the Japanese had been able to board the surviving ships. They had approached and boarded under cover of darkness, and killed most of the surviving Mongols. Almost a year later, in September 1275, Kublai Khan send five more emissaries to Kyūshū. They refused to leave without a response. Tokimune had them brought to Kamakura, and beheaded them. Then, in July 1279, Kublai sent five more emissaries, and Tokimune had them beheaded as well. The Mongols sent a bigger invasion fleet in 1281. According to their chronicles, the fleet had 900 ships containing 17,000 sailors, 10,000 Korean soldiers, and 15,000 Mongol and Chinese soldiers. But that was just the part that set out from Korea. An even larger force of 100,000 sailed from south China in 3,500 ships. Japanese histories report similar sizes. The 1281 Mongol fleet was big, but surely not that big. Modern historians suspect that its descriptions were exaggerated like medieval European chronicles. Some historians have observed that it's highly unlikely that a medieval invasion fleet, even one mounted by the Mongol Empire, would rival the June 1944 Normandy invasion in numbers of men and vessels while traveling ten times the distance. Modern estimates range from one-tenth to one-half the reported size, from 14,000 to 70,000 men total. The Mongols landed in Kyūshū, where Tokimune's samurai had fortified the beaches. Then, on August 15, another typhoon hit. It hammered the coast of Kyūshū for two days. Most of the Mongol ships had put out to sea to ride out the storm. The invasion fleet mostly consisted of flat-bottomed designs intended as riverboats. They were difficult to sail in the open sea in good conditions, let alone during a powerful typhoon. Many of the ships were destroyed. Thousands of troops hadn't made it back to the ships. They were massacred on the beaches by the samurai. The Kamikaze or "Divine Wind" became Japanese military legend. Hōjō Tokimune died in 1284. His wife, Kakusan-ni, became a nun as was customary then. She founded the Shōkozan Tōkei-ji temple in 1285. It was a nunnery, men could not enter for over 600 years. She made it a refuge for battered wives. It was also called Kakekomidera, the Fugutive Temple. Men could easily divorce their wives, but wives could only get a divorce with difficulty. 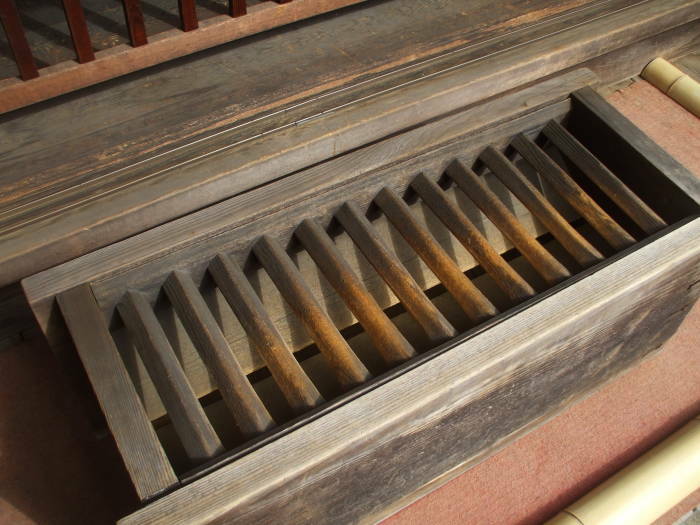 Tōkei-ji protected the code of en-kiri or divorce for women. It allowed women to become officially divorced after staying there for two or three years (depending on which source you read). The temple retained the right to grant divorce until 1873, when a new law created a Court of Justice to handle the cases. The early 1870s were a strongly anti-Buddhist time, as the Emperor had returned to power. Shintō was strongly favored over Buddhism as the cult of the divine Emperor built up, leading eventually to World War II. Tōkei-ji came under the supervision of the Engaku-ji temple in 1902, and a man was made the abbot. Taihei-den or the Peace Hall is the main hall here. It enshrines the principal image of the temple, a seated statue of Shaka Nyorai, or Shakyamuni Buddha, the historical Buddha. Above is a good look at a typical offering box. A row of angled square bars crosses the top opening. Below that are two tilted panels. A tossed coin will likely bounce off one or more of the top bars, then drop to bounce between the tilted panels before falling through the slot at the bottom. 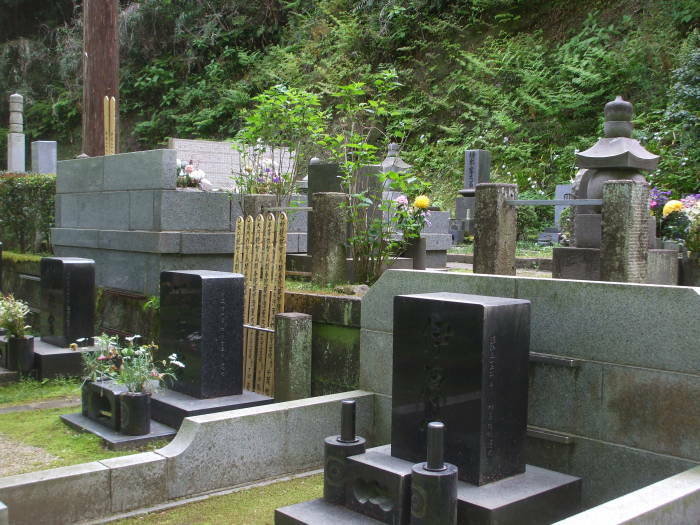 There's a large cemetery laid out up the wooded slope behind the temple. 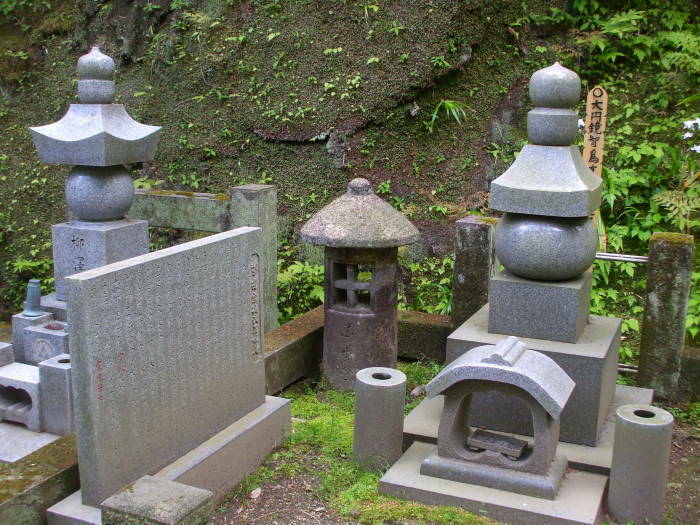 Many of the graves are marked with gorintō, a Five-Ringed Tower, a stone form of pagoda commonly found in Buddhist cemeteries. The five segments represent the elements of the Buddhist cosmology. These five elements form the body of the cosmic Buddha Mahāvairocana, our own bodies, and the physical world. Jewel-shape or Space at the top, cube or Earth at the bottom. The five elements plus wisdom make up the universe. The elements are not destroyed at death, and so it is possible to join with Mahāvairocana. Sometimes the segments are labeled with Sanskrit letters in the Siddhaṃ script. 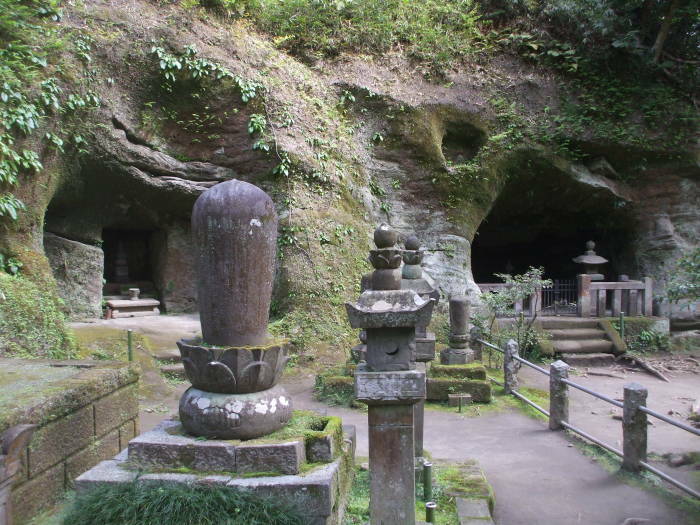 Some of the memorials are in yagura, small caves that may be partly natural then enlarged by hand. 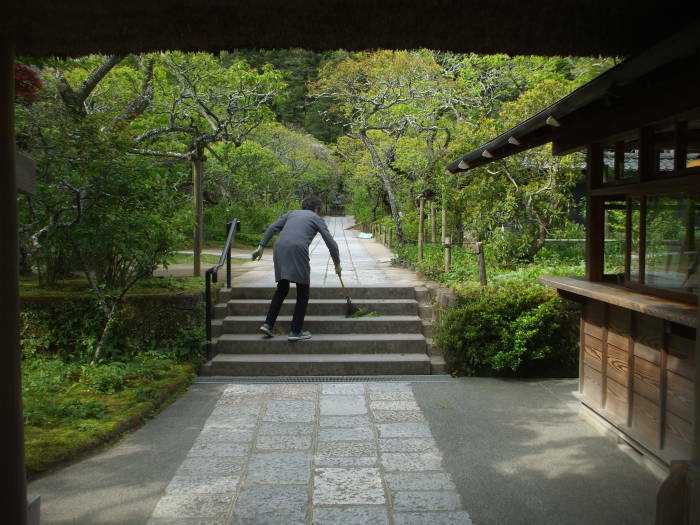 There are many yagura around Kamakura, on a later page we will see several on a path along the ridge surrounding Kamakura, and also within Kamakura.